Black Ice Software - Tiff Viewer version 11.53 is released! Tiff Viewer version 11.53 is released! In order to provide the best support for our customers technical support requests must be submitted through our website's support forms. Technical support requests for Customers not having a valid maintenance subscription will be handled through the Black Ice Forum. If you no longer wish to receive this email, please click here. Black Ice Software has released version 11.53 of the Tiff Viewer. This version includes new major improvements for Administrators to fully control how users utilize the Tiff Viewer features. Administrators now can disable access for all tabs on the Options window, Tools, Annotations and Document Cleanup tabs on the ribbon menu. 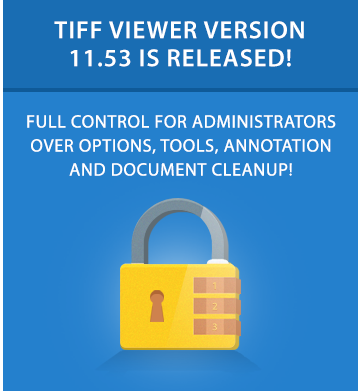 With these improved new features, Administrators can now restrict All Users from changing the TIFF Viewer settings, or to use any feature under the Tools, Annotations or Document Cleanup ribbon menu. The latest Tiff Viewer improvements to disable/enable access for specific features or options also can be configured through the Tiff Viewer MSI Installer, allowing Administrators to preconfigure the Tiff Viewer on large scale deployment through Group Policy installations. Do not forget to subscribe to future releases by purchasing maintenance. With an active maintenance subscription, you will receive all new releases for free with your subscription! Priority email technical support is also included in your subscription. For more information, call us at +1 (561) 757-4107 Extension 2, or impactsales@blackice.com. Download the Latest Tiff Viewer!